Chevalier de Kirschbaum, sold 1840; Hippolyte-Alexandre-Gabriel-Walter Destailleur [1822-1893] (Lugt 740), Paris (sale, Paris, Morgaud, 26-27 May 1893, lot 7 [to Beurdeley for 11,550 fr. ]); Alfred Beurdeley [1847-1919], Paris (sale, Paris, Rahir, 31 May 1920, lot 123); H. Grosjean-Maupin (his sale, Paris, Hôtel Drouot, 26-27 March 1958, lot 43, as Delaune); (sale, Paris, Hôtel Drouot, 15 March 1989, lot 44, as Rosso Fiorentino); purchased by Ian Woodner, New York; by inheritance to his daughters, Andrea and Dian Woodner, New York, 1990; gift to NGA, 1993. Master Drawings from the Woodner Collection, Metropolitan Museum of Art, New York, 1990, no. 23 (as attributed to Rosso Fiorentino). Nine Old Master Drawings: Recent Gifts from the Woodner Collection, National Gallery of Art, Washington, 1993 (checklist only) (as Fontainebleau School). The Touch of the Artist: Master Drawings from the Woodner Collections, National Gallery of Art, Washington, 1995-1996, no. 51, as "Design for a Parade Morion." 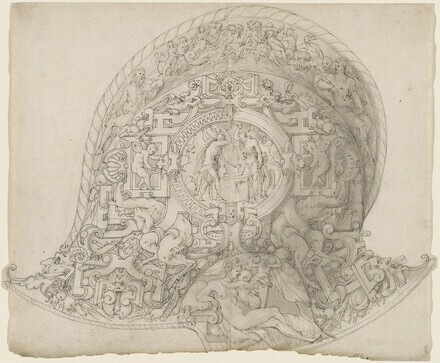 Renaissance to Revolution: French Drawings from the National Gallery of Art, 1500-1800. National Gallery of Art, Washington, 2009, 28-29, 275, no. 5. The Touch of the Artist: Master Drawings from the Woodner Collections. Exh. cat. National Gallery of Art, Washington, 1995-1996: no. 51.